Novotel Sydney Manly Pacific is introducing an action-packed children's program, a special Family Flicks package and a range of family friendly benefits to entice families to Manly these school holidays.Kids can show off their creative talents with a fun colouring in competition and have the chance to win one of many special prizes. The Plaster Master returns to Novotel Manly throughout the Spring Holidays. Children can paint their favourite figurines and decorate them before taking them home. Music and Dance enthusiasts can show off their moves during the Kids Disco. 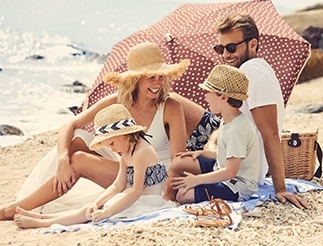 To plan a beachside family getaway, a special Family Flicks Package is on offer, which includes overnight accommodation for two adults and two children (16 years and under) and a welcome pack for the children. Parents can snuggle up with their little one’s under a doona and enjoy free movies throughout their stay. Situated just opposite famous Manly Beach and surrounded by shops and restaurants, the hotel is based in the prime location. Those travelling with family can indulge in an array of premium hotel facilities and services such as a rooftop pool with panoramic views, family friendly dining at Zali’s Restaurant, children menus and kids’ corners, free breakfast for children under 16, Manly Beach Health Club and spacious rooms, some offering impressive beach views. The hotel’s school holiday package comes just in time as Novotel Sydney Manly Pacific introduces 326 new Sleep-Maker beds to offer guests an oasis of comfort. All Sleep-Maker beds come with brand new pillowtop mattress, pillows and quilts. In support of the local community, Novotel Sydney Manly Pacific has decided to donate all previous beds to Lifeline Manly, Balgowlah, the Manly Community Centre, Salvation Army and Wesley Church. Take a NSW TrainLink Family Break, Kids Travel for $1!